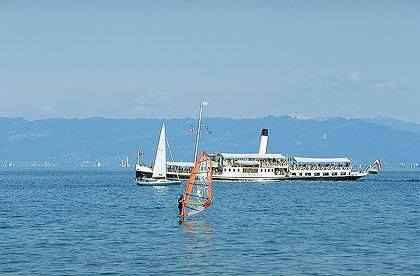 (Konstanz) Swiss Lake Paddle Steamer Sailings Cruise Timetables for Konstanz, Brienz, Geneva, Luzern, Thun, Zurich, also Italian Lakes Maggiore Como and Garda) giving latest news, fleet lists, features, archives, pictures and loads more! If you particularly want to sail on the paddle steamer - check the official HSG publicity carefully to avoid being caught out ! Are you aware of any other paddle steamer sailings (Public or Charter) that have visited any Swiss piers at any time........ or any proposed future sailings ?